Cultivating a healthy workplace doesn’t mean a loss of corporate or team identity. Characteristics unique to the way of working, such as stress at times of high pressure are inevitable. 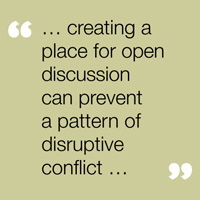 Recognising this and creating a place for open discussion can prevent a pattern of disruptive conflict. Recognising and resolving inappropriate workplace behaviour launched 8 June 2010 click here to read more in HR Magazine.